Adult, Child, and Infant Online CPR Certification Course. Guaranteed Acceptance or Your Money Back. Course follows the latest CPR guidelines. Printable certificate & wallet card available after passing the exam. Today's technology allows us all to get educated and receive certified training in many different areas. 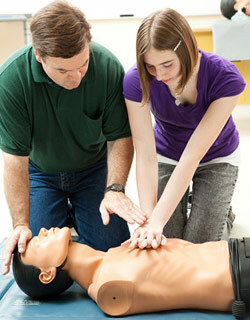 CPR and AED certification online is just one of those areas that you can take advantage of. We've certainly come a long way since the earliest training videos and classes. This online CPR and AED certification course is designed for the individual who has never been certified in CPR before. If this is the first CPR and AED training that you are taking, then this is the course for you. Coaches, babysitters, teachers, lifeguards, students, or anyone that is looking for a CPR certification should take this course. This online certification course will take approximately one hour to complete and the course material will remain open for the FULL TWO YEARS OF YOUR CERTIFICATION so that you can come back any time to review and get updates or review the material (updates are done frequently!). To register for the online CPR/AED Certification Course, please create an account or login.